The US Men’s National Team saw a surge of patriotic support during the 2014 World Cup. But now that the players have returned to their respective clubs, can Major League Soccer maintain the quadrennial hype stateside and seize its place in the American sports market? Uruguayan David Texeira, forward for FC Dallas, was acquired as a young designated player for the club in February of 2014. He, along with other international talent, is helping raise the profile of Major League Soccer in the United States. The light in Cesar Velasco’s home office is on, but outside his window it’s cold and black. It’s two in the morning, and Velasco is on the phone. Eight thousand miles due west, it’s 11:00 a.m. local time in the United Arab Emirates—and that’s what has Velasco up so early. He’s working out a deal to take his team to the region for preseason camp. If there’s one thing Velasco has learned since stepping into his role in 2011, it’s that no two days will ever be the same. The former soccer player born in Mexico is now a senior director of international marketing and communication for FC Dallas. Orchestrating soccer activities around the world is as tricky as it sounds. Velasco, who talks quickly and lets his passion for the sport escape into each conversation, paces back and forth as he looks at a dog-eared calendar. 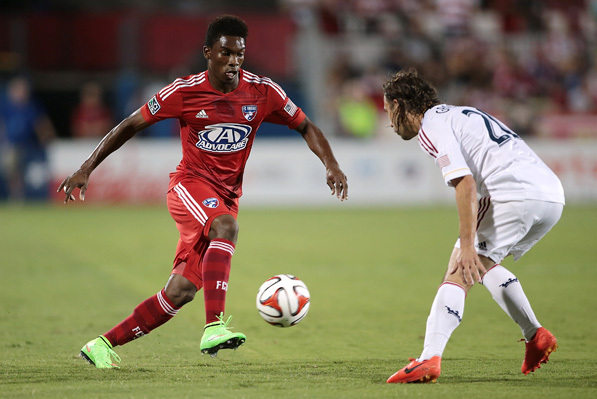 FC Dallas is part of FIFA-sanctioned Major League Soccer (MLS), the highest level of the sport in North America. Its 19 teams (scheduled to expand to 22 by 2016) start tune-ups in early February and play through October, followed by playoffs. The MLS Cup then plays through the first weekend in December. In the offseason, players compete in international tournaments or scatter to their homes around the world. In the wake of the 2014 World Cup, Velasco is doing what all his counterparts are doing league-wide: trying to capitalize on the unprecedented surge in the sport’s popularity and seize the opportunity to engage life-long fans. Rabid and casual fans alike looked on across the nation as the United States’ World Cup team fought low expectations and mounting injuries to escape the formidable “group of death” pool until its dramatic 2-1 knockout loss to Belgium. More than 26 million Americans watched that game. Do we, as a nation, finally “like” soccer—a sport once believed to be too foreign and too slow to catch on here? The question is, where to go from here? Do we, as a nation, finally “like” soccer—a sport once believed to be too foreign and too slow to catch on here? Can MLS compete with Major League Baseball, the National Football League, National Basketball Association, and National Hockey League? Can the league support stars like those in La Liga (Spain’s top professional soccer league), Serie A (La Liga’s Italian counterpart) or England’s Premier League? Can North America attract those players who will in turn drive stadium attendance and lucrative television deals? Velasco says yes. In fact, MLS is well on its way, he says. In May, MLS announced new television agreements with ESPN, Fox Sports, and Univision that will televise league games through the year 2022. Each outlet will air one MLS match of the week, while ESPN and Fox Sports will televise doubleheaders on Sundays at 4 and 7 p.m. (eastern standard time). More households than ever before now have access to league games, and Velasco says that will only help increase the sport’s popularity. “Everything is pointed in the right direction. We now have more fans who understand the sport and recognize who the key players are. Now, they can watch those players in action in a league that’s growing in terms of size and quality,” he explains. Listen to anyone involved in MLS talk for more than five minutes, and you’ll likely hear mentioned the year 2020. That’s when MLS hopes to be known as one of the world’s top five soccer leagues. To realize the goal, advocates like Velasco are working around-the-clock to find new ways to bring fans into the stadium to follow these fledgling and previously unknown teams. And since Velasco fights for share in a market that hosts the Dallas Cowboys, Dallas Mavericks, Texas Rangers, and some of the top college teams in the nation, the pressure is on. When Velasco pushes through the crowds to greet the FC Dallas team bus at an away game, his mind takes him to a similar scene, three decades ago, when he was inside that bus, nervously bouncing a soccer ball off his knee while wearing his nation’s green, white, and red. After working his way up on youth teams, the young goalie was selected for Mexico’s pre-Olympic team in the 1980s. As the players step off the bus, Velasco can identify with his FC Dallas players, having a deep understanding of this stage in their lives. First out is a 20-year-old goalkeeper from the Mexican National Team. Velasco rushes to accompany FC Dallas star goalie Richard Sanchez through the crowd. Velasco calls Sanchez one of the best keepers he’s ever seen. Located in Frisco, Texas, the club’s home, known as Toyota Stadium, is much more than a sports arena—it’s a soccer oasis. The $105 million, 145-acre multipurpose campus houses a 20,500-seat pro soccer stadium, 17 tournament-grade fields, and the youth development academy. Since opening in 2006, the complex has attracted more than a million annual visitors. And while all parts of the complex are crucial to the team’s long-term success, Velasco has a special passion for the amateur training facilities. “We are attracting the most talented young players in the nation who want to train here for a shot to realize their MLS dreams,” he says, adding that top prospects are now choosing soccer over other sports. While universities once developed the league’s future stars, 80 percent are now trained by MLS franchises, like Richard Sanchez was at FC Dallas. Fabián Castillo is arguably the fastest player in MLS. He has matured quickly this season under the guidance of his coach and countryman Oscar Pareja. FC Dallas was an original member of Major League Soccer when the league was formed 20 years ago. Over the following 13 years, the franchise tallied 180 regular-season wins and made 10 postseason appearances. The team moved into FC Dallas Stadium, MLS’s third soccer-specific stadium, in 2005. There was a time when the average American sports fan couldn’t name an MLS star, but all that changed in 2007 when the league announced a blockbuster deal that sent Manchester United and Real Madrid superstar David Beckham to the Los Angeles Galaxy. The deal—reportedly worth $250 million—paid instant dividends as the California franchise saw season-ticket holders top out at 11,000. Recent reports show the upward trends are continuing. In 2014, ESPN’s annual sports poll found MLS soccer was almost as popular as Major League Baseball with fans ages 12–17 for the first time in the poll’s 20-year history. About 18 percent of responders in the age group self-identified as avid fans of both leagues. In 2012 the poll ranked MLS second only to the National Football League for fans ages 12–24. Since 2002, MLS has seen clothing sales explode by 100 percent. Eighteen years ago there were three ownership groups in the league; today there are 21. These stats have Velasco excited. “If you look at our growth since the creation of the league, the momentum soccer now has will not stop. We’ll see faster acceleration with generational change,” he says. In the United States, generations of kids who grew up playing EA Sports’ FIFA video game franchise are playing youth soccer with immigrants from nations where soccer is king, and the Hispanic population in the United States is expected to triple by 2050. The kids who watched Brazil win the World Cup in 1994 are today the fathers who play and watch the sport with their children—and they’re doing so in record numbers. Almost 25 million Americans play soccer, and 15 million of those are under the age of 18. Dan Hunt, FC Dallas’s president and owner, chats weekly with fans on Facebook and is often spotted interacting with fans during home games. The goal, Velasco says, is to create an authentic and consistent fan experience. With five supporter clubs (the Dallas Football Elite, Dallas Beer Guardians, Lone Star Legion, Red Shamrock, and El Matador), each FC Dallas fan can find a place in the stadium to call home. It can be hard to keep up with Velasco because he’s never in one place for very long. “This is never a nine-to-five job,” he laughs. “There’s not a routine. Whatever you put on the calendar won’t happen the way you think it will,” he says. If you try to reach him during the day, you might catch him ushering the media into a press event, spell-checking a game recap, or talking to leaders from the Dallas-Fort Worth community about business development. Or maybe he’ll be on the phone arranging a friendly against an international team or talking to leaders from other soccer leagues. But game day is what Velasco lives for. Although kickoff is at 8:00 p.m., he pulls in to Toyota Stadium and rushes into his office early. As he logs into a computer, he’s already on his phone checking the weather. He takes a swig of coffee as he looks at his watch: 2:05 p.m., about six hours until game time. Velasco and FC Dallas staff load up official social media outlets and start communicating with fans. They share where the team is, who they’re playing, which players are active, what the key match-ups are, weather information, kickoff times, and details about stadium promotions and giveaways. The rest of the staff arrives, and together they push tickets, answer requests from the media, prep the press box, write game notes, and visit broadcast teams. Three hours before the opening whistle, Velasco is out on the concourse interacting with sponsors. Inside the stadium, his staff is putting final touches on everything from locker rooms to concession stands. The gates open, and ushers tear tickets and hand out promotional items while the fans storm in. “WE! ARE! THE HOOPS!” Velasco hears the familiar chant echoing around the stadium and checks his watch. 7:58 p.m. For 45 minutes, his work is done, and Velasco becomes a fan. “Once we hit game time, it’s a celebration. It’s all about soccer. There are no promotions and no time-outs. We all are watching the game,” he says. After stoppage time, he helps organize on-field activities and manages on-screen entertainment and promotions until second time kicks off. After the game, Velasco rushes down to help clear the field. Then, he walks through the tunnels and up the stairs where he’s greeted by an array of cameras and reporters. The press will interview both coaches before heading to the home team and visitors’ locker rooms to talk to the players. That’s when Velasco will return to his office to help prepare press releases and game notes. With those underway, his staff conducts fast postgame reports with all the department heads and reviews any special activities or incidents. Hours earlier Toyota Stadium was lit up and roaring with fans. Now it’s dark and silent. When Cesar Velasco logs off his computer and reaches to swipe his car keys from the office desk, it is just past midnight. Soccer fandom in Dallas is ramping up but can Velasco—and the rest of Major League Soccer—really sustain success, or will the post-World Cup frenzy fade? Some experts aren’t so sure. Stats guru Nate Silver’s fivethirtyeight.com says just two percent of respondents to the Harris Poll listed soccer as their favorite sport this year compared to three percent in 1985. A similar Gallup poll saw numbers rise from two percent in 1981 to just four percent in 2013. Most of the goals scored in the World Cup were kicked by athletes who don’t play in MLS. The United States’ most popular player, Tim Howard, plays in England. 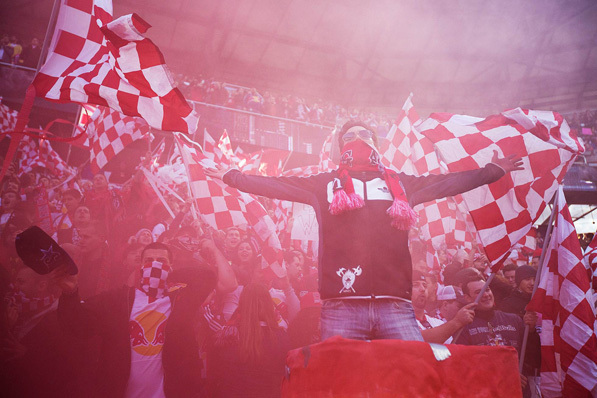 Soccer fans fill the South Ward Supporters section of New York’s Red Bull Arena.